Bill graduated from Hampton High School in 1947, had a brief stint in the Merchant Marines, then started at the College of William and Mary. He was drafted into the Army during the Korean Conflict and served in Hawaii. After serving, he went on to graduate from William & Mary in 1957, then received a graduate degree in Mathematics from North Carolina State University in 1960. Bill valued education and enjoyed interacting with people, talking about political and recent events. He worked as an electrical and systems engineer with IBM near Washington, D.C. in the 1960s, Harris Corporation in eastern FL in the 1970s, and then with the Mitre Corporation in McLean, Virginia. While with Mitre, he lived and worked overseas for several years each in Greece and Germany. Bill retired from Mitre in the early 1990s and moved to Yorktown, VA. After retirement, he served as a part-time docent for many years at the Mariners Museum in Newport News, VA. Always adventurous, Bill loved sailing – both for leisure and racing – and owned three sailboats through the years. He also loved traveling with Elaine throughout Europe, as well as long drives to visit family and friends in other states for events like graduations and weddings. 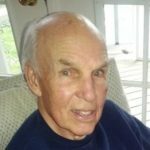 He was an avid golfer, enjoyed reading, and especially enjoyed caring for his dogs. Bill will be remembered as a kind and gentle man who enjoyed sharing his childhood stories with his family. A remembrance ceremony will be held from 2-5 on Sunday, April 7, 2019 at his home in Yorktown, VA. Amory Funeral Home handled his remains; however, because of Bill’s love and awareness of the environment regarding oceans and the coral reefs, his final resting place will be handled by Eternal Reefs, Sarasota, FL. In lieu of flowers, please make any contributions to the Alzheimer’s Association or your local SPCA/Animal Shelter.